We dwell on this subject because we’ve seen so many final drives totaled due to a clogged case drain filter. 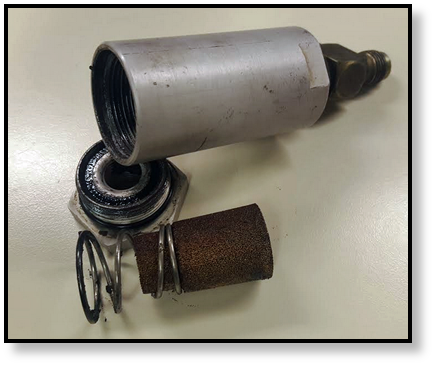 About 90% of the final drive motors we work on have a case drain, whose function is to drain off excess hydraulic fluid from the final drive motor. The most common type of case drain filter is housed in an aluminum cylinder about 3” to 3.5” long and about 1 ¼” in diameter. Once the filter housing is removed from the case drain line, you’ll see a hex nut. Once that hex nut is removed you can pull out the filter element and the spring that holds it in place. The filter element is made from sintered bronze. If it is gold or bronze in color, it should still be good. If it is not, then you need to either clean it with mineral oil or replace it. The case drain filter should be checked/replaced every time other filters are replaced. Another important aspect of final drive maintenance involves checking the gear oil levels in the planetary hub. Gear oil levels should be checked after every 100 hours of operation. 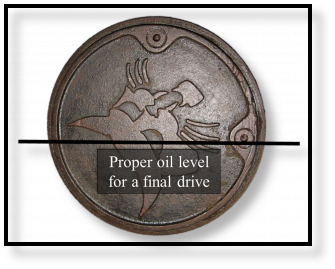 If levels are low, then the gear oil should be topped off. If it has to be topped off a bit too often, that could indicate a leak. A wise course of action would be to check the seals for signs of damage or wear. Over time, and as it is exposed to elevated operating temperatures, gear oil begins to degrade. A general rule of thumb is to change out the gear oil once a year. We have a blog post to help guide you through the process if you are unfamiliar with it and, fortunately, the process is quite straightforward. When doing your daily walk around, take a moment check for signs of leaks coming from the final drive. Hydraulic fluid has a much thinner consistency compared to gear oil. If you run across a hydraulic leak, it could be a failed seal, a leaking hose, or case drain issues. 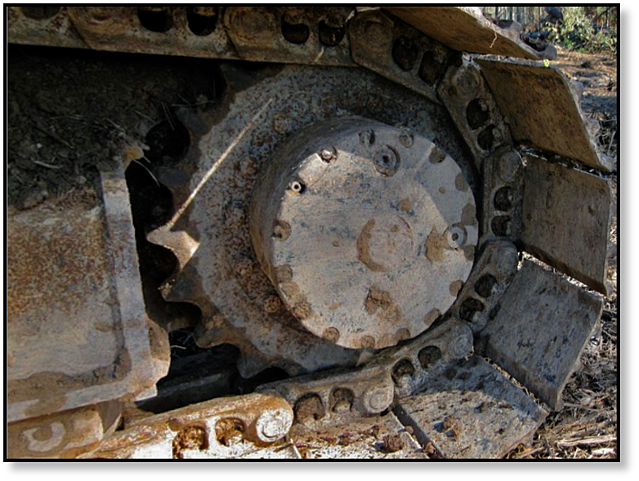 A significant amount of fluid leaking out will normally be a hydraulic leak because there is far more hydraulic fluid flowing through a final drive than there is gear oil. If you discover that fluid has been dripping onto the track, the most likely culprit is gear oil, and the issue will be a failed seal. If the leak is near where the sprocket mounts, then the main seal needs to be replaced. Your final drive hydraulic motor needs regular maintenance, just like any other part of your equipment. A good final drive maintenance plan for your final drive includes checking the case drain filter, checking and changing the gear oil, and checking for leaks. 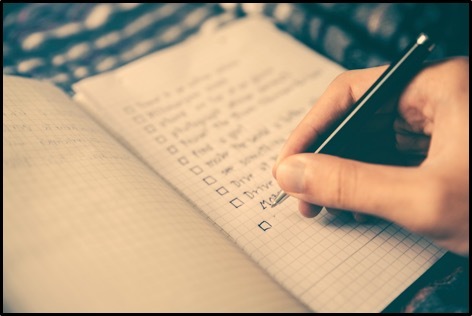 We highly recommend that you refer to your owner’s manual for manufacturer recommendations on the the appropriate time intervals for performing these maintenance tasks. These simple tasks are key to having efficient and dependable final drives that cause minimal down time so that your compact track loader or mini-excavator keeps running without interruption.